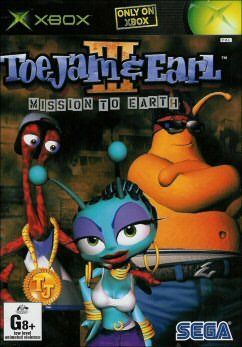 The third instalment of the Toe Jam & Earl series makes it's way onto the XBox in it's own exclusive outing. This game was a bit of a weird one in that I really enjoyed it though I found the game not entirely to my liking. You get to choose your characters and the whole idea behind the game is that you make your way to Earth and "funkify it" by collecting items and the like. It sounds cool I know, however I am a bit of a platform game playing nut and I just couldn't stay interested. Graphically the title is a mish mash of triumphs and tragedies. For the most part you are travelling around in a world of lovely textures and animations till you notice that your character really doesn't look that good and there are silly errors such as perfect landscapes and then around the surface of ponds and streams there are harsh jaggy lines that destroy the moment. There are number of effects used in the title and I especially like some of the water environments that surprised me with their quality. I am still of the opinion that the best in game water I have seen would have to be on GameCube, however this is very nice and shows that the machine can do it if programmed properly. 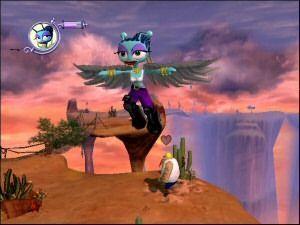 The game runs sort of like a Crash Bandicoot title in that there is a hub world that branches off into other realms that can be explored. The game is smooth to run and the frame rate stays very constant. The whole vibe to the title is very funky and music related. There is groovy music played throughout and even more available as you find records you can play tracks off. The cool thing about the title is that you can play single player or with a friend and there is also an option to play randomly generated maps, ensuring that no game is the same twice. Even in split screen mode the framerate cooked. Be sure to check all levels for the powerups scattered throughout the level as well as there are some really neat effects. However, due to the nature of a random map, there is some flow problems to the feel of a map and some of the keys that you collect are not quite where you expect. Of course as in any platforming game there are a number of attacks and due to the power of the XBox these look beautiful in the game in the way that they are depicted. 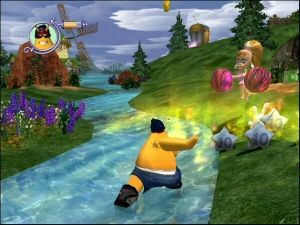 All things said and done, I think that ToeJam and Earl III should appeal to most gamers to at least give it a try. 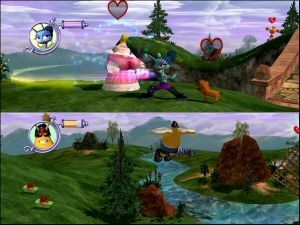 There is a lot of fun to be had, though I must confess that it didn't have the allure of a lot of other platforming games on both GameCube or PS2 and whilst thoroughly enjoyable, I didn't have problems putting the game down when other activities demanded my attention. I recommend ToeJam & Earl to anyone interested in platformers. I think it's a nice addition to the XBox game library and one that even the kids will have a blast playing which is something at this time, that the XBox lacks. I'd give this one a quick overnight rent to make sure that it's your cup of tea. It's a nice game that may not appeal to everyone.